After some tentative steps, I’ve now gone all in with digital comics. Although over the years, I continued to purchase comics out of habit, I actually read very few of them. This is primarily due to a lack of time since most of my spare time is spent working on Rob Hanes Adventures, but also because of a general malaise on my part about current mainstream comics. I feel very out of step with most superhero comics, especially since they require a level of commitment — due to story arcs that often cross multiple titles — I just don’t can’t make. As mentioned in an earlier post, last fall I purchased a Kindle Fire HD. While reading comics on it wasn’t the main purpose for the purchase, the device certainly was an excuse to give digital comics a try. One of the main attractions for me was that it resulted in less “stuff” accumulating—though I’ve never been a comic-book “collector” per se, the comics I buy generally get thrown into a box and at my age, it’s time for me to stop accumulating and start divesting. An added bonus is the general look of the work on a digital tablet—with its backlit display, the colors “pop” off the screen relative to a print page. I have also found that I’m more apt to read something I buy on the fly as the impulse strikes, rather than pick it up at a comic-book store and put it aside for later reading. Until I stumbled across this series in Comixology, I was totally oblivious to both the series and what appears to be Marvel Comics’ “adult” line of comics, its Max Line. Though Nick Fury is an integral part of Marvel’s movie “universe” as played by Samuel Jackson in the Avengers and Marvel’s other films, the character was originally the title character of a World War II comic-book that debuted in the 1960s called Nick Fury and his Howling Commandos. Caucasion in the comics, Fury was brought into the modern age in 1965 as the head of S.H.I.E.L.D. (as he is in the recent Marvel films) to capitalize on popularity of the James Bond and knock off spy flicks of the era. The new series, Fury: My War Gone By, covers the character’s career trajectory in the post World War II era as a CIA special operative. 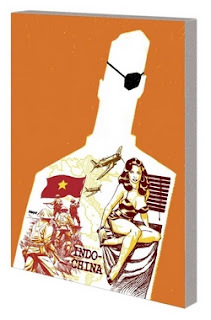 In contrast to the portrayal of the character in his other incarnations as a high-level super spy, this series is a much grittier, “real-world” series that puts the character in the middle of major touchstone historical events that involved the CIA, beginning with postwar Indochina where the U.S. early on helped the French combat the rise of the communists; the Bay of Pigs debacle in Cuba; and, in the most current issue, the Vietnam War. The series is written by Garth Ennis, who obviously has an affinity for this kind of material since, in addition to his mainstream work, he has developed quite a sideline writing gritty war comics. Though I was a big fan of the genre in the 1970s, I have been often ambivalent about Ennis’s work because his stories sometimes have a satiric, irreverent edge that no doubt is intended to highlight the absurdity of war but which I have found to be sometimes off-putting and too graphically violent. I have no objection to such material per se, but until now I generally did not find his work to my liking, though Ennis has also proved himself to be capable of emotional and moving work, like his haunting Battlefields: Dear Billy (which I strongly recommend). 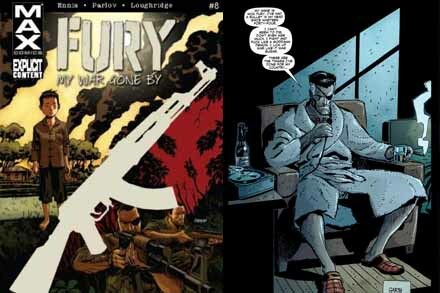 While Ennis obviously is no doubt thrilled by the opportunity to play in Marvel’s sandbox, Fury: My War Gone By gives the writer a chance to explore a subject that clearly interests him greatly—namely, the CIA’s more questionable activities during the Cold War—and meld them with strong characters. In the series, Fury is a mercenary war junkie as well as war-weary; though clearly a patriot, he is also cynical about the politics, ambition and self-interest that drives the policies that he’s advancing through his work. A through-line in the series is his relationship with an ambitious senator; the senator’s wife who is also his mistress; and his handler, TK, who unlike Fury is able to retain his humanity and moral compass that Fury seems to have lost. Given the subject matter and the intersection with real events, I see the series as a modern-day counterpoint to Milton Caniff’s classic adventure strip series Steve Canyon, which ran from 1945 to 1980. 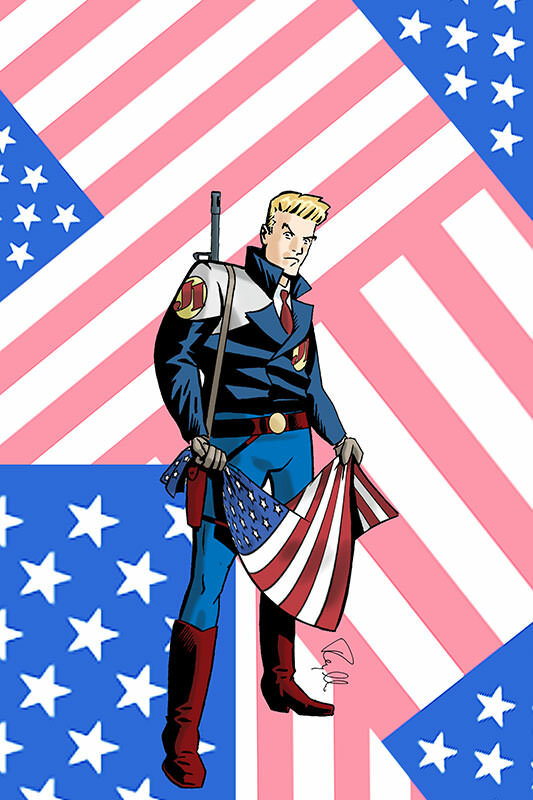 Canyon in early years covered many of the same territory with a hero who was less conflicted about his mission and his identity, but given Caniff’s close identification with the U.S. military and the country’s policies (which were, to be fair, a reflection of his time), Fury comes at the material from a complete different point of view. Though I do not mention the series’ artist, Goran Parlov, I cannot say enough about his artistic and storytelling abilities. Simple in the tradition of Roy Crane and reminiscent of the cartoony-yet-illustrative style of Jean Girard in his Blueberry series, I doubt the work would have made such an impression on me without his collaboration and outstanding contributions. Though it appears the bloom is now off the rose a bit, in 2011, DC Comics re-booted 52 of their titles with great fanfare and success, dubbing the event the New 52. One of these titles was Batman, one of multiple titles featuring the popular character. 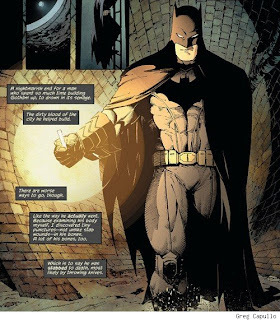 While several of the titles briefly re-piqued my interest, Batman was one I have stuck with due to the team of Scott Snyder (script) and Greg Capullo (art). The first 12 issues introduced a new criminal enterprise to the series, the Court of Owls, a sort of underground “star chamber” in Batman’s hometown of Gotham City that has existed for more than a century. Though its history is tightly intertwined with Bruce Wayne’s family history (a device that, frankly, is at risk of being overused), it’s nevertheless a good mystery that is boosted by Capullo’s art. And, of course, the conclusion is open-ended enough that the enterprise will return again in the future. After that, the series brought back the writing and drawing team’s fresh take on the Joker. Given the level of evil villainy rather commonplace in films and even television, it’s clear there was a need to up the anté. Though I did not read the crossover stories that led to the Joker’s appearance in Batman, the Joker here is, if possible, even more unpredictable and chilling than previous incarnations. There is a real body count here, though ultimately I felt the concluding chapter was a bit of a letdown and a bit of a cop out—involving another near-reveal that will leave readers hanging until the Joker returns again.